Known for its durability and strength, leather furniture can last for generations. Provided, that is, it is properly cared for. Unlike many synthetic fabrics used for furniture, leather is a natural material and requires specific care. This is especially true when it comes to storage. Placing a leather couch or chair in the corner of the garage without going through the proper steps can result in furniture that is cracked, stiff, and discolored. With some basic care, leather furniture can be kept in a garage. Clean the leather furniture thoroughly using a professional grade leather cleaner. If possible, have the furniture professionally cleaned. 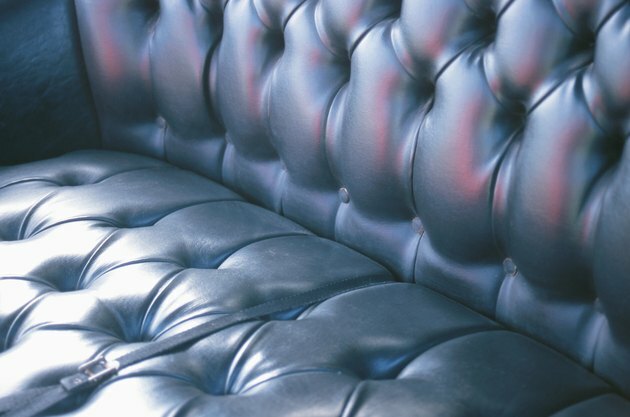 Treat the furniture with a leather conditioner. Pastes and oils tend to last longer than spray-on conditioners. Reapply conditioner on a regular basis. If the garage does not go through significant temperature or moisture variations, twice a year should suffice. Increase frequency based on storage conditions. Place the furniture away from external walls, especially if they are not insulated. Leather can be damaged by significant temperature and humidity fluctuations. Since 1998 Yvonne Garcia has been a technology and business consultant. She focuses on developing and conducting trainings on a variety of business issues and software programs, writing manuals, proposals and how-to guides as well as designing and maintaining blogs and websites. Garcia received her Bachelor of Fine Arts in creative writing from Goddard College. How do I Store Leather Furniture in Freezing Cold Temperatures?